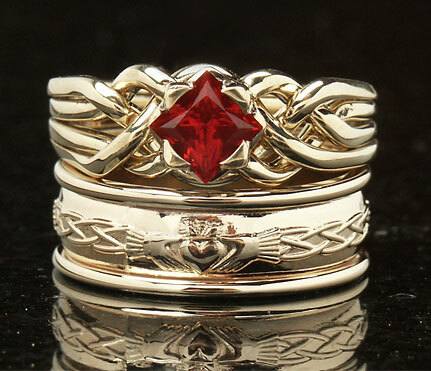 Thank you again for emailing that you are interested in a princess-cut ruby puzzle ring with a Celtic Claddagh band, along with a matching band for your fiancé. Allow me to show you several options, along with current prices. You mention that your hands are small, so you may prefer the medium weight (16 gauge) puzzle ring. It is a matter of taste, though, as we’ve made 13 gauge puzzle rings holding a 1Ct stone in sizes as small as 4, as shown in the image of Laura’s ring, below. Bear in mind that the addition of a wedding band will make her set about as wide as the 2CT set that first caught your eye. Below is the set that caught your eye. This puzzle ring is also a heavy 13 gauge. The Cambridge is the only puzzle ring we carry that is not named for the style of setting holding the stone. 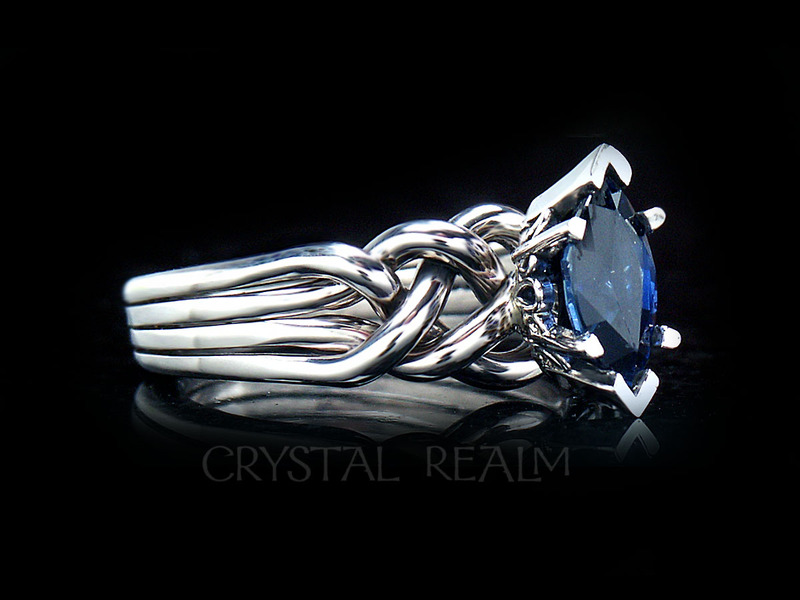 This one is named for this particular style of four-band puzzle ring. The weight is an appropriate size for such a large gemstone, and clearly you’ve said you don’t want something this big. We can make a gemstone puzzle ring in any weight from 13 to 16, in other words four weights, including this one and the medium, 16 gauge shown further below. 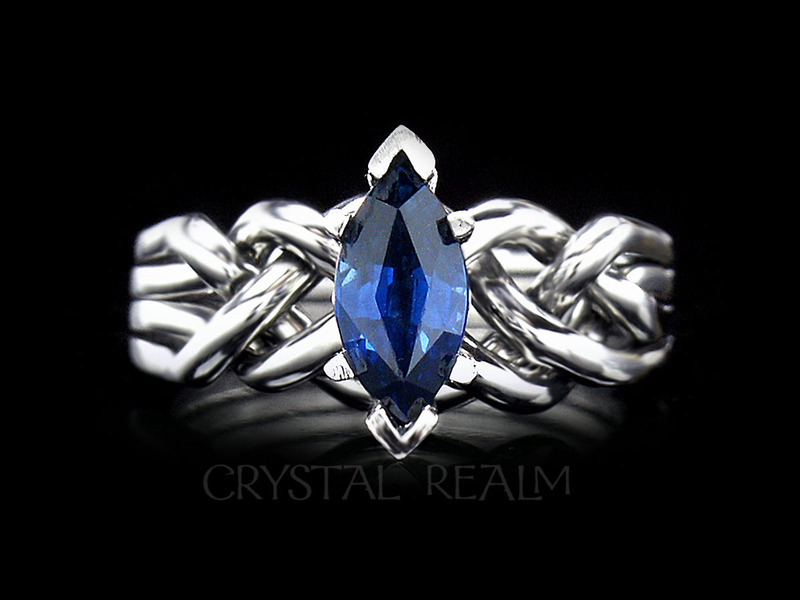 The claddagh ring is available in this heavy weight with trim, shown, which is 7mm wide, and a light weight with trim, which is 6.5mm wide. 6.4mm = 1/4 in. Though the medium weight, shown below, is the one we make most frequently, and it works for gemstones up to .72CT, the weight of your bridal set is a very individualized decision. These next sets are made with the untrimmed version of the Claddagh band, which is 4.5mm wide and which we often pair with the medium weight puzzle ring. 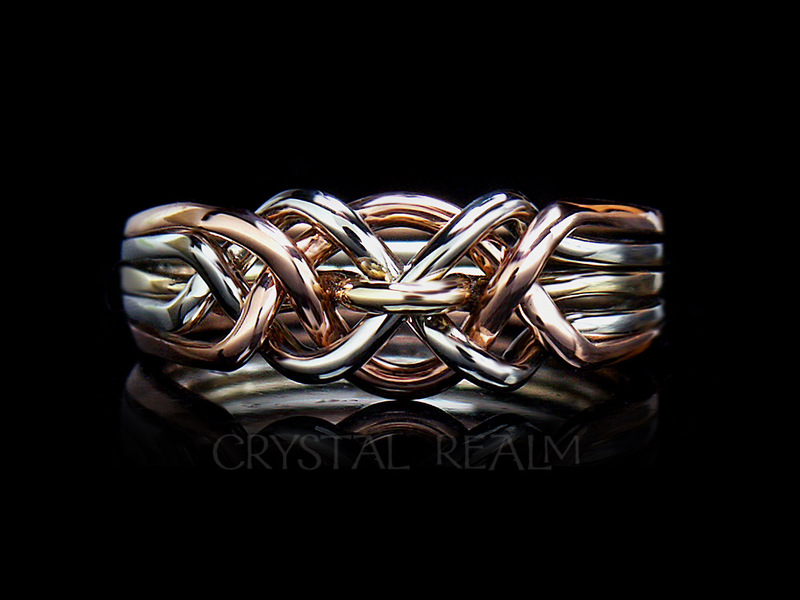 This Avalon puzzle ring has an “open-weave” which we don’t usually do with the Claddagh band (though we can), because the band doesn’t lie flat against the open puzzle weave. Know that we can make this puzzle ring “flatter” on the sides in a standard or tight weave, which will lie flatter with the band. Select your style of puzzle ring and your weave. Juliet puzzle ring showing our exclusive Celtic trinity knot diamond or gemstone setting. 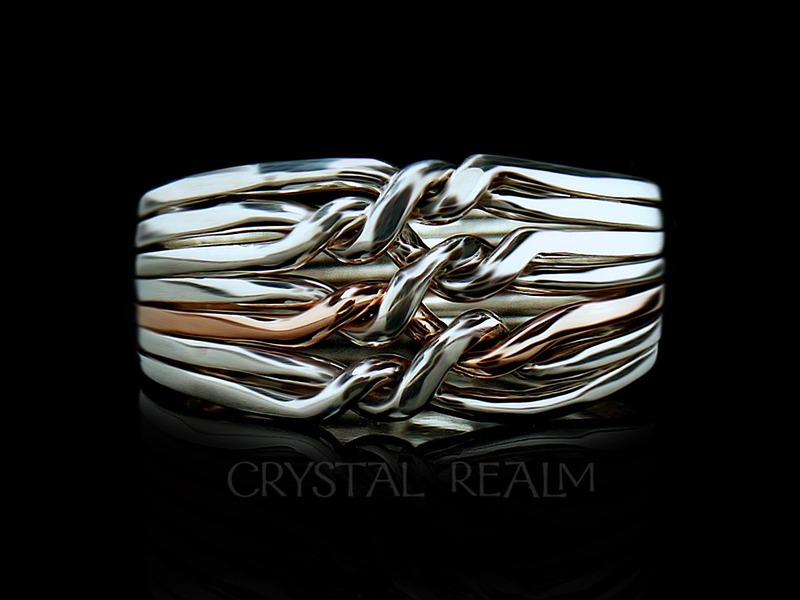 This puzzle ring has an open weave, but we can make it with a standard or tight weave, whichever you prefer. 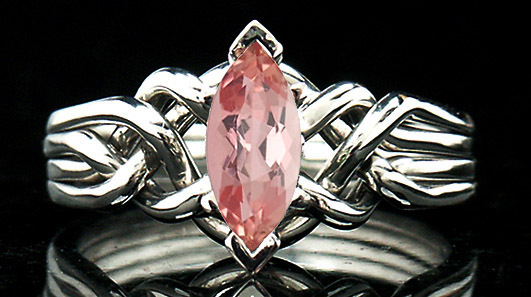 We created the Juliet setting with the sculptural trinity knot on each side, so that you could have something incredibly unique holding your gemstone. 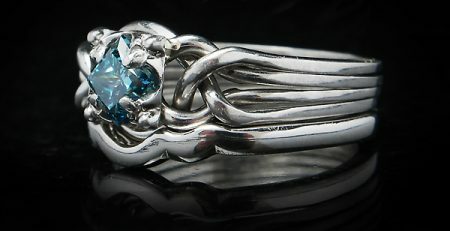 But having a puzzle ring in any style is unique in itself, so pick whichever style looks prettiest to you. If he wants a wider band, then we can create his Claddagh band with trim, available in two weights – light at 6.5mm wide – or heavy in widths of either 7.7 or 8.7mm. If you like, I can provide prices for this version. I find that men who wear a size 10 to 11 usually prefer the wider 5.5mm band (unless they want a very-much wider band with trim), but once men need a size 11 or up, they usually opt for the trim version. For the princess-cut lab-created ruby, the next stone size up from .43CT is .79CT. If you’d like to look at that, we can do that next. It means a little heavier puzzle ring, but nowhere near as heavy as the one holding the 2CT. I look forward to your feedback. Thank you so much!